In the initial phase of my gardening, I was concerned only about annual vegetables. If you rent your living space, this can be an almost excusable mind set. But the day after I purchased my home, I was already busy ripping out old ornamentals and making space for edible perennials. As time progressed I began to zoom out, more and more, getting a fuller picture of how my garden and landscape would need to function. Planting annual vegetables is only one aspect of a more complex system. For a garden to thrive, planting annual vegetables is only one aspect of a more complex system. Growing annual crops requires inputs in the way of fertility. Initially, we may turn to fertilizers. Then we may start to experience the need for pest control. So we reach for our pesticides (perhaps organic, since we care about our environment). We yield a nice crop, but we are left with all sorts of dead plant waste. Should we throw this out, maybe to prevent disease from building up in the garden? Instead, why not build connections? Take that plant waste and compost it! Hot composting can help to destroy weed seeds and plant pathogens. Either a large pile or an insulated tumbler can fit the bill. But why not incorporate some redundancy? 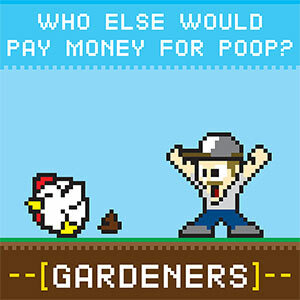 Some red-worms would allow you to vermi-compost as well. Now your waste is eliminated! The Many Functions of Perennials! That's right. Perennials merit some serious attention, particularly for you home owners. Would you prefer to eat unripe fruit that was shipped from 3,000 miles away? Or would you rather walk into your backyard orchard for some sweet succulent peaches, Asian pears, apples and much more? FOOD PRODUCTION: In addition to fruits trees, there are a variety berries that can be turned to as rich source of Vitamin C and many other antioxidants. Often overlooked though are perennial vegetables which return year after year with little or no effort. Sea kale, asparagus, sorrel, sun-chokes and so much more! Finally, we should never forget nuts which are excellent energy sources, possibly to the extent of a staple crop. FERTILITY: Did you know that some perennials like seaberry (sea buckthorns), goumis or New Jersey tea serve a vital role as nitrogen fixers? They serve as hosts to beneficial micro-organisms that are able to capture nitrogen from the air and fix it to the soils in a plant available form. Other plants like comfrey are nutrient accumulators. They send down massive tap roots mine minerals from far below the surface top soil. Through mineralization, deciduous trees acquire nutrients which then fall to the ground every Autumn. 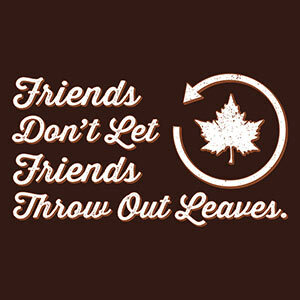 Those leaves are a vital part of our nutrient cycle. HABITAT: Old fallen trees are a rich source of habitat to all sorts beneficial organisms. Trees also provide nesting sites for birds. Pollen and nectar from trees, berries, herbs and flowers feeds bees, butterflies and predatory insects. But why should you care about habitat? Are you tired of fighting aphid infestations? Perhaps you could attract more ladybugs and green lacewings by growing flowering herbs. These provide rich sources of pollen and nectar, encouraging beneficial insects to take up residence. Many types of birds will help greatly by consuming some of your insect pests. So have you offered a place for the birds to nest? Do you provide a source of water for them? What about amphibians? Avoiding pesticides helps out. But placing little logs and stones in your landscape creates a spot for toads to hang out. In turn, you'll notice the slug population becoming more manageable. In addition to organic pest control, we also rely on animals for a very special role: pollination. 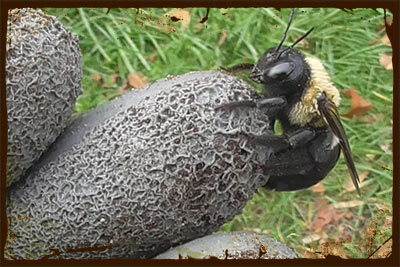 Honey bees, mason bees, even carpenter bees work hard at pollinating our fruits and vegetables. This ensures a bountiful yield. So take care of these little guys and try to make room for them! Get the Most From Your Annual Veggies! Take time to examine the interdependency of all components within your garden. How are the nutrients being cycled? Are you building fertility through integration of perennials? Have you created habitat to sustain a complete ecosystem? As examine techniques for growing, I encourage you to maintain a broad perspective. Think about how each component interacts with others. Working with natural systems is always easier than fighting them. And the rewards make it worth all the effort!